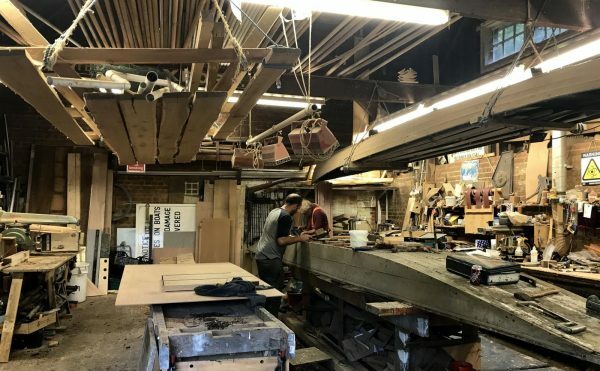 Roger recruited Bob Dowling, an experienced carpenter, and together they set about repairing, replacing and adding punts to the now 80 strong fleet. As well as maintaining our fleet we have built punts for Oxford colleges along with many private sales including exporting to France and Ireland. Having served a long apprenticeship in traditional punt building Roger took advantage of Bobs broader carpentry knowledge and together developed a punt design that improved on the traditional method. The bottom of a traditional punt was made with planks of soft wood, usually yellow or pitch pine. This would expand when wet and contract when dry (much like a beer barrel) so over winter when the boats are out of the water the seams would open up and the boat would need to be sunk at the beginning of the season to “take up”. This movement within the boat is where problems would start with ware and water ingress fatigue would take it’s toll. By building the boats with a marine plywood bottom we have eliminated that movement therefore increasing the boats lifespan reducing the maintenance and increasing the overall stability of the boat without detracting from the traditional look.